There is truly nothing more eye-catching than a nice spectator. The amount of white that is usually present can’t help but allure you in to their captivating presence. Obviously you will have some that are much nice than others, but when done right and incorporated into a lovely outfit, there is nothing that screams ‘cool’ more so than them. I can’t for the love of me remember who these ones are by. I know that it is someone that you would not expect, like J.M. Weston or something of that nature, but nevertheless, the pair presented is probably among the nicest that I have ever seen. Everything about them is bang on, from the pattern, to the medallion, to the shape of the facing, the natural finish left on the welt stitching and most importantly the fact that it is a 7 eyelet shoe. Rarely do you see 7 eyelet shoes and even more rarely do they look good on a dress shoe, as sometimes it becomes a bit of an overkill. But the makers of this shoes nail it right on the head and did a fantastic job of making this the perfect spectator…….I would love to have this in every color combination conceivably attractive! Today is the last day to get your entries in for the shoe polishing contest so please do so, as I will not accept new entrants from tomorrow. I have a pair of correspondent shoes; polishing them causes some angst. They’re well-conditioned. I try to be very careful when I must polish, applying it rarely, sparingly and with great deliberation, but I always seem to get a smudge somewhere. Do you have any tricks or best practices on how to prevent this? I’d love to have another pair or two, but can’t quite screw up the courage to do so, given my inability to keep the lighter areas pure. I have a pair of these…http://www.herringshoes.co.uk/product-info.php?&brandid=6&shoeid=2026. I apply everything with a single cloth-wrapped finger, putting the products on the very tip of it. But when the risk is too great (like this white-bordeaux example) i simply put some painter’s tape on the border lines. Masking tape all around the brogueing? I call BS, or you have way too much spare time! 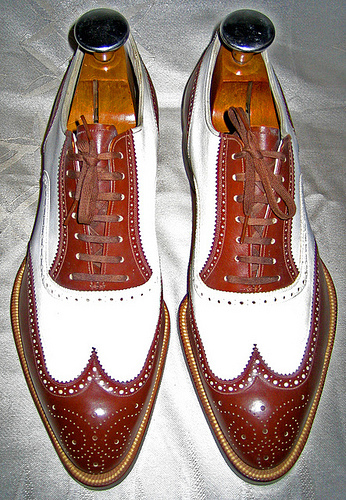 As these are all leather rather than something more awkward like tweed or canvas, how about just polishing the white first, and leaving a reasonable amount of clear polish on the white areas until you’re done with the brown/burgundy – a slip of the clear polish onto the coloured areas won’t matter. But that way if you slip a little smudge of brown onto the white, it will wipe straight off without a mark, as it’s “floating” on the new polish coat and not contacting the leather. You can then brush any remaining clear polish off the white areas last of all. It’s a method that i use when I don’t have time restraints, but it doesn’t require SO much time… Since you don’t need to make a beautiful cover, but only an efficient one, you can do it in about five minutes. Of course, when you polish the white section you don’t need any special attention. You guys are all brave…I don’t even shine my spectators and it’s not because I am afraid of staining the white, it’s more so because I dont need to attract any more attention then they already do! But to be honest, i can’t give any tips on how to prevent staining. Being careful is the only thing that I can say. Using different rags to polish the white and dark areas. And using a wax based polish would be best as it wont be strong in pigment. Other than that, just making sure that you are careful is the only way I know how to keep ’em clean! This pair of shoes belongs to me. Back in 2004, I purchased them on eBay: deadstock in their original box. Size 9D, if anyone’s wondering. They’re vintage 1930s or early ’40s. I’ve not been able to find a trace of information about their maker, the “Chappell Shoe Co.” The shoe’s closed channel soles are crosshatched; the shoe’s interior is lined in white kidskin. Yep, kidskin. Very nice Marc, great find!! Do you wear them? Stunningly beautiful shoes! I’m green with envy! But please tie the laces correctly – the bows should lie east-west, not north-south. A correctly tied bow is the looped eqivalent of a reef-knot. The bow that you have tied is a granny-knot and therefore likely to slip or come undone, in addition to looking untidy.